The field project described in the Big Horn Basin is a capstone experience for our innovative full-year course sequence that combines two geologic disciplines traditionally taught separately (in "silos") sedimentology/stratigraphy and structural geology. We feel that a holistic approach that combines an understanding of the processes involved in both disciplines allows students to more easily develop the geologic history of an area from collected field data. The result is a two-semester course sequence that integrates the concepts of the two disciplines through a full year of study. While we have more than ten different field projects during the year, these are simply "snapshots" that allow the student to only see a piece of the geologic puzzle. These exercises do develop skills that the student will use in the capstone experience the geologic synthesis of a specific region currently the Sheep Mountain region of the Big Horn Basin. The field-mapping project in the Big Horn Basin is followed by five weeks of sequenced work that allows each student to synthesize a complete geologic (sedimetologic and structural) history of the region. This includes the construction of a geologic map and cross-sections, understanding the depositional history (including environments of deposition), the syn- or post-depositional deformation of the region and an attempt to put the local geologic history into the context of regional deformation and tectonics. 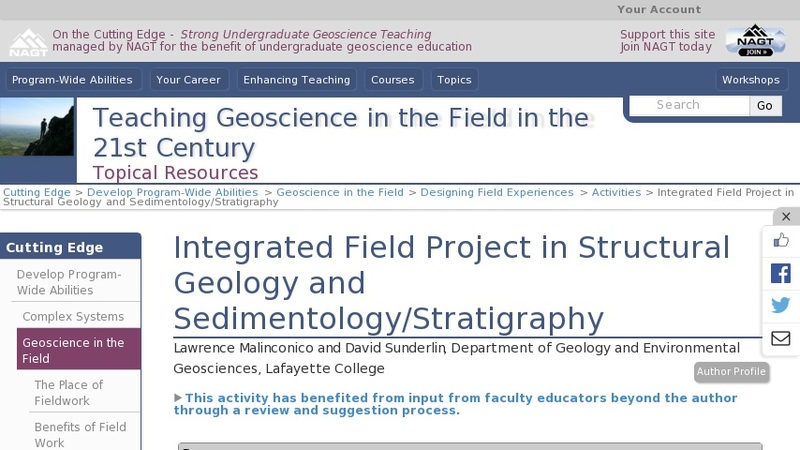 We believe that by integrating the disciplines into the two-semester sequence capped with the field mapping and synthesis better prepares students to "think like a geologist".